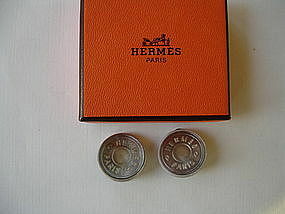 Fabulous Hermes Paris earrings in original box. They measure 7/8" in diameter have a classic mother of pearl finish with reverse carved Hermes Paris in face. Clip backs hallmarked Hermes Paris Bijouterie Fantaisie.